Parenthood is almost always at its best when it’s telling stories that could only be told about its characters that are, nevertheless, universal. A discussion about the N-word is one of those things African-American parents have been having with their kids for decades now, but it’s also not the sort of thing you often see on network television. And if you’re a confused white guy who would have no idea how to navigate this sort of situation, like me, well, the show gives you Crosby as an entry point. He’s the guy who accidentally exposed his son to a rapper using said word, but he’s also someone who can’t really set the situation right because his understanding is nowhere near his wife’s understanding. There are plenty of interracial marriages on TV, but most of them largely pretend that race is something that would never come up between two people who love each other, no matter how much of an empathy gap is there. And, yeah, Crosby loves Jasmine and his son more than anyone on earth, but he’ll never quite understand this thing that defines them in the eyes of too many people. “The Talk” is another episode in a season that has hit the ground running and is quickly building toward being the best season this show has ever had. Parenthood has always struggled with how to start a season, often employing a slow build that bubbles over into big dramatic tension. Season three employed this sort of plotting to great effect, as it closed with some of the series’ strongest episodes ever; but the early going of that season was often a huge mess, with storylines pinging all over the place in ways that didn’t always add up. The same was true of the first two seasons as well, yet season four has mostly avoided these problems. It’s not building, really. It’s telling a mix of stories that are all playing off of each other in a variety of ways. As much as the Kristina cancer arc is centering the season, the other storylines are playing out all at their own paces and dealing with questions you don’t always see tackled on shows like this. It’s a surprisingly ambitious season of television, and ­yet it’s quintessential Parenthood, low-key and lovely. “The Talk” specifically refers to the discussion Jasmine has with Jabbar about the history of African-Americans in the U.S., but it also refers to the talk that Adam and Kristina keep putting off, the one where they tell their children and loved ones that Kristina has cancer, that she’s very sick and might die. 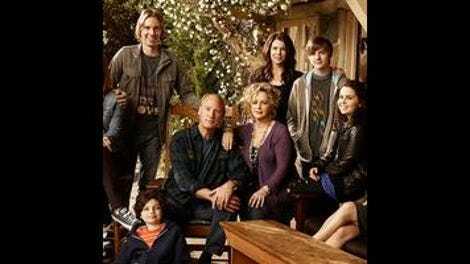 After two full episodes, Amber remains the only Braverman who knows, and all she knows is that Kristina is sick. The tension over knowing and not telling is eating both Adam and Kristina alive, and Kristina’s all too happy to throw herself forcefully into Max’s campaign, if it means that she’s going to be able to stop thinking about the disease that’s eating her alive. Really, the idea of “The Talk” refers to what’s not said more than it does what is said in this episode. Joel and Julia continue to struggle with the fact that they can’t build a bridge between Victor’s past and the present he’s been rapidly thrust into. It was inevitable that we’d have a, “You’re not my real mom/dad!” moment, but it’s still horrifying when Victor yells this at Joel on the baseball field after throwing a tantrum. Joel can understand why Victor’s doing this. He’s been thrust into a sport he doesn’t seem all that interested in, with a bunch of kids he doesn’t know, in the kind of neighborhood he never would have lived in before. Yet that doesn’t mean Victor’s words don’t hurt. There’s a lot of Victor’s past that maybe Joel and Julia could discuss with their son, but it’s not as if they’ll really understand what he’s saying. They can listen and think about it and process it, but they live lives of privilege, and Victor’s only recently been handed one. The best Joel can do is play catch as a form of truce and hope things take a gradual turn for the better. Now, I still have my doubts about the Victor storyline. By skipping over five months of story time, the show mostly avoids talking about the real issues here, which include the fact that Victor had a life before he became a Braverman-Graham, and that life was a fair spot more difficult than the one he leads now. (I am, of course, just guessing on this, but it seems unlikely that his mother would waive her parental rights because of a minor misunderstanding down at the police station.) The series necessarily takes the point-of-view of Julia and Joel, and there have been some nice moments in these stories. But there’s still the sense that the show isn’t sure how to view the fact that Victor hasn’t immediately warmed up to the two as parents. Maybe it’s playing a long game here, and we’re going to get a whole episode where the kid spills all, but it still feels like the show is avoiding some potentially fertile storytelling areas, just because they might be too difficult to talk about. That said, some of this is always going to work, and it’s not like I’m made of stone. I teared up when Joel and Victor played catch, and I’m not someone who gets emotional at TV all that often. The other two storylines were also about communications breaking down and then building up again, but they were slightly more minor than the more dramatic stuff going on in the other households. I enjoyed seeing Sarah hang out with Hank’s daughter and smooth the waters between the two of them, but I think we all know where we’re headed with this whole, “Oh, hey, my ex-husband Seth never gave up his band after we had kids, but you gave up your photojournalism after you had your daughter, and don’t you have unexpected depths, Mr. Romano!” thing, and it’s nowhere any of us wants to be, least of all Jason Ritter, who just needs to eat, Jason Katims, you hear me?! I also enjoyed Zeek hanging out with Ryan from down at the VA center, if only because it gave Matt Lauria something to do. Lauria’s a great presence in search of a TV show worthy of him, and I always appreciate Katims bringing around Friday Night Lights alumni to pal up with his current show’s cast members. I just didn’t expect it to be Zeek this time. I’m all for Ryan dropping by again. But for me, the whole episode was about that Crosby and Jasmine plotline, where the two of them had an honest heart-to-heart that helped clear the air about how being black has made Jasmine feel in her life, even if Crosby will never quite understand it on any level other than intellectual. But he says the right things, and he feels the right things, and he’s trying. And when you love somebody, that’s all you can really do, isn’t it? You just head in, making sure your heart’s in the right place and your head’s in the right space, and you open up the lines of communication. Sooner or later, everybody else on this show is going to realize that’s what it takes and start to talk. Braverman of the week: Is there any way to pick someone other than Joel? While his wife’s out working and driving around a car, he’s doing the tough work of integrating Victor into a family he probably doesn’t feel entirely comfortable in. And he throws a mean baseball. Zeek’s frustrations with the sprinklers should have been incredibly uninteresting, but I sort of enjoyed his mania over trying to find what was wrong with them. It was also another sterling example of the show I call Bonnie Bedelia Spends Her Time. Max Braverman campaign advisers! Now that we have a poster, let’s come up with some good slogans for our man. Those vending machines aren’t going to replace themselves! The bit where Jasmine had to explain slavery to Jabbar and he looked over at his dad with just a hint of betrayal was a gut punch for me. That’s one of those conversations I intellectually know takes place but also one I have never really spent time imagining. Great work in that scene from all involved. I watched this one on a screener where I had to constantly rewind scenes because the music was drowning out the dialogue. Was that just a bad preliminary mix, or did you guys have that problem, too? Hank’s daughter wants a shorter skirt Photoshopped onto her in the Bieber picture, and both Hank and Sarah say, “No!” at the same time, and then they laugh, and the happy music plays, and they look at each other, and Jason Ritter is standing just offset hoarding bagels from craft services and weeping about what he knows is about to happen, Katims. I hope you realize that!